If you ever have a chance, there is one thing you must try: polo. However, polo is not a game for the faint of heart. Imagine racing down a 300 yard field with seven other mounted players bearing down on you with large, wooden mallets in hand. All the players are trying to smack a tiny ball into their respective goals and you never know when you or your horse are going to be bopped in the head by a stray mallet. If you’ve never seen or played a game of polo you should understand that the rules were made only to keep people from playing the game. There seemed to be a lot of them and an infraction incurs a penalty. As fun as it was to learn how to play and whack the ball down the field, I can’t tell you how many penalties I earned while playing. Although, the elation I felt when I finally hit that ellusive little ball through the goal posts was incredible. It’s a small wonder I was able to make it up and down the field at all considering the state of my horse. Actually, it was more of a pony. A very thin pony that would barely trot to the ball unless I was “rude” to it by using the little whip the instructor had given out. When the game first begins it is like an ultimate stand-off. 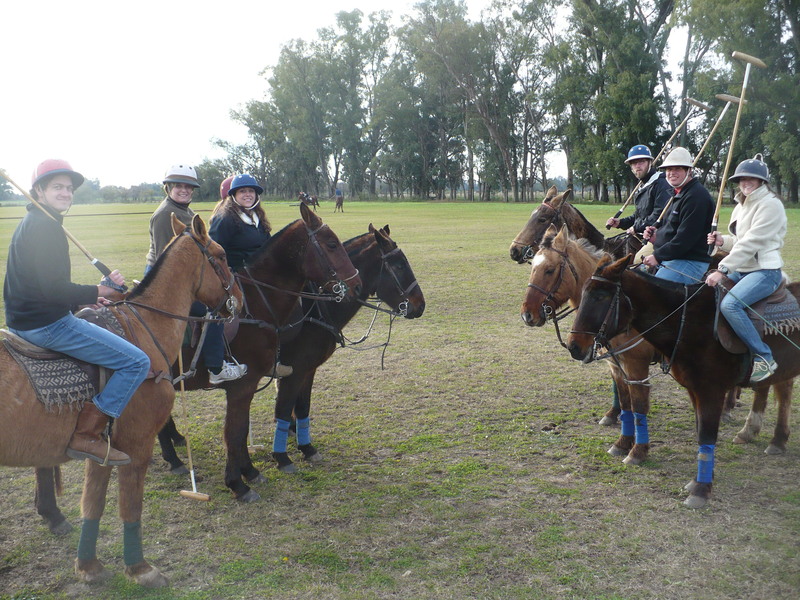 Both teams line their horses up facing each other about three feet apart. The ball is then hit into the midst of players and it is every man for himself. Like I said, this game is not for the faint of heart. You can get a penalty for everything, and I did. You can’t cross in front of another player’s horse when they have control of the ball. You can only hit the ball with your right hand. There are countless more rules than this. I was in a group of seven and after our instructor gave us some basic instructions we split up into teams and had a match. I am proud-and very surprised-to say that our team was awesome and would have made quick work of the game. The winner is the first team to score seven. However, when the score was six to one our instructor decided to join the other team. Needless to say, they quickly caught up. In the end, it was close, but my team prevailed but it wasn’t without a lot of effort at the end. Our instructor was completely right when he said that the last goal is the most difficult and the other team had great defense. I would highly recommend trying this game at least once to everyone. However, if you aren’t accustomed to riding horses, you may want to make sure you won’t have to be doing anything strenuous for the next few days. I can tell you the recovery period for your behind is nearly as brutal as Ole Miss losing a football game, and that is something that no one enjoys.